There's 16 comments so far. Last comment was posted 1 day, 12 hours ago. « Are You a Lurker? I want to be a hearty, bearded sailor who’s charge is managing the money and doling out rum and grub. Luckily, my dreams are not too far off, as these were common duties of the ship’s purser. And though this sounds glamorous, the purser often had a bad lot, rarely ending up wealthy and always being suspected of scheming and cheating the crew, who bought all their bedding, clothing, hooks, parrots, and other booty from him. Taken blatantly from this ship station is the name of Pusser’s, a navy rum made as far back as 1655 to “support” the navy. However, it wasn’t publicly available until 1979, which just so happens to be the Kaiser’s birth year. And if the tales be true, Pusser’s is still produced in the same wooden barrels it was 200 years ago. Continuing my quest to find out glorious bits of information for you about Navy rum, my search turned to Erik from Underhill-Lounge. The juiciest hint I got out of him is that Martin from Forbidden Island procured a very old navy rum for a pretty penny. Can you tell us about it Martin? But back to Pusser’s… one of the company’s signature recipes is the Painkiller. Yes, I’m indeed posting about a company’s cocktail. The Painkiller has a unique property that makes it a flexible beverage to serve to guests: as the recipe is, it can be made with varying amounts of rum and still maintain its character. 2oz to 4oz is a safe bet. Obviously the Kaiser goes with the ceiling. Sadly, that doesn’t allow it to be put in the fun Pusser’s mug (thanks Eric!). What is much worse, however, is that Pusser’s is not easily found in PA, so once my secret stash was depleted, I tried to find a combination of other rums that would work well. I ended up with the simple mix of 2 1/2oz gold Puerto Rican and 2oz dark Jamaican. Upon offering up such a substitution to my fellow tikiphiles, I was immediately chided with worries that I was bringing the Painkiller a bit too close to the Pina Colada. Does it change the flavor? Yes. Is it still delicious? Quite http://www.iutoic-dhaka…otc.html. Maybe we can call it the Mistaken Painkiller. 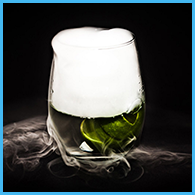 Blend at the speed of light for no more than three seconds, and pour into an enormous and daunting glass. Grate some nutmeg and cinnamon on top. Or don’t. Add all the ingredients to the blender except for the rum and ice. Whaz it up for a few seconds. Add in the rum and spin again for only a second. Pour into a hefty goblet filled with crushed ice. I really had a lot of trouble avoiding the separation. Once it hit the -8F ice, it seized up and curdled. It still tasted fine… but it looked less appealing. Perhaps one of our chemists can explain this phenomenon and offer a solution. What are your strategies for keeping the coconut cream from separating? And what’s your favorite brand? Do you know any other tasty drinks that contain Pussers? What combination of rums would closely approximate a navy rum? Why, in fact, I just wrote up another use for Pusser’s on Sunday. Note the giant flower a la Kaiser Penguin! I first heat the coco lopez and shake it with the most acid of the tarts (pineapple, lime, lemon, etc). I then add the liquids in order of their acidity. I don’t think you can avoid a certain amount of precipitate – the more saturated the fat, the more it will be likely to solidify. You just need to get the fat particles as small as possible so they can be imperceptible. I’ll bet a bit of some kind of emulsifier would help — cheap and easy would be a small amount of egg yolk, or powdered soy lecithin. This will just keep the tiny bits of fat small and keep them from re-combining into larger bits. But like with butter/honey in the Don’s Pearl, a good amount of a nice acid and ramos-gin-fiz-like shaking, and you should be laughing. Did they get the eye-patch from the purser too? I’ve got a little 50ml bottle of the British Navy Imperial Rum. Maybe I should crack it open and see how it compares to some combinations of other rums? Erik, The Goombay smash looks quite tasty… any other Pusser’s potions up your sleeve? Craig, How warm to you get the coco lopez? Jimmy, I think that’s a wise idea. Will you report back? I LOVE the Painkiller, and it’s one of the tiki drinks I find myself going back to over and over again. I tell people that once they try one, they’ll never drink another Pina Colada. Also- I have a reliable source for Pusser’s, so I can get you some more no problem..just let me know. You can Wiki the much longer history of the Royal Navy and rum, but anyway, my jar is one of the final 650 that were in storage in the warehouse. It is a blend of Jamaican & Guyana pot & column distillates. Mostly pot still as it’s big and funky- fills the room up with it’s aroma. It’s also insanely wonderful. It’s now more like $3500 today. Most of the remaining rum was sold off on the cheap at navy bars in Gibraltar, or around the Caribbean- it’s shocking how inexpensive it used to be in the 70s and 80s. But soon all that was left was the stuff in the Royal Navy’s warehouse. So you can try it at Forbidden Island, but start saving your pennies! Now, on to the next phase. After it was gone, Charles Tobias bought the recipe from the Royal Navy in 1979, with the promise to donate the some of the profits to the Sailor’s Retirement Fund, and launched Pusser’s. Today Pusser’s comes from all over hell and who knows where- the origin countries on the label keep changing. I do know that he is still buying part of his blend from Guyana, but I don’t think there’s any more Jamaica in it. (The Guyana blend is partially produced in a 200 year old wooden pot still- not barrel as mentioned in your post- that was used for the Royal Navy rum as well.). It says it’s uncolored and unflavored, but I don’t buy that. Sadly they have also dropped the proof to 84 in the States, and it loses some of it’s charm as a result. On to the Painkiller: Not actually a company drink, though they think it is. It’s from the Soggy Dollar Bar on Jost Van Dyke in the Briish Virgin Islands. (where Pusser’s is headquartered). You order it by number to indicate the strength: Painkiller #3, Painkiller #4, etc. Yes, you should use Pusser’s for this- it’s hard to find a funky substitute. El Dorado 5 year would be closer. OR DO. The spice is a huge part of this drink- do not omit! In the BVI, it’s just nutmeg. I like Jeff’s addition of cinnamon, and that’s how we make it- with both. Coco Lopez: We have food service sized cans, and put them in a hot water bath for about an hour. Then remove and shake them like crazy. We then put them in pump top bottles for ease of service, and in the fridge at the end of the shift. Then the bottle comes out the next night and goes into the hot bath for an hour before starting. We never have separation problems. Oh my god I must get back to work. Damn you penguin. The key to keeping the Coco Lopez from seperating, is to buy it in the new squeezy tube! Instead of the can, they have a plastic bottle, like what mustard and other condiments come in now. This allows for easy measuring just the right amount and no waste, and no seperation. Get it now! Makes all these coconut cream recipes so much easier! I have a question regarding the use of Coco Lopez. The recipe calls for “coconut cream” not “cream of coconut”. I think they are two different things. Coconut cream is made with coconut flesh and water or milk. I’ve made my own by soaking shredding coconut flesh in milk, then processing it in a Vitamix blender and squeezing it through cheesecloth. Cream of coconut seems to be very sweet and has strange gums and thickeners added. This sounds like a great drink, but the sweetness of the fruit juices seem like more than enough without the additional sugar from the Coco Lopez. I’d try this drink with homemade Coconut Cream instead. The way I would look at “CocoLopez” is as a coconut version of Orgeat. Basically a coconut syrup. It should be quite sweet, as should a Painkiller. Yes, CocoLopez contains preservatives and various gums. The preservatives keep the sugar and coconut proteins from fermenting in the heat of the Caribbean. The gums keep the oils emulsified in the syrup. If CocoLopez didn’t have those things, it would have a very short shelf life and the coconut oil would rather quickly separate from the water. This drink was more than certainly invented with Coco Lopez, which has been the standard for things like the Pina Colada since the 50s. The drink is not that old, and invented at a bar that you have to swim to get to. Remember that unsweetened pineapple juice has plenty of it’s own acidity, as does orange juice. The net effect is certainly a sweet drink, but not as much as you may fear. I think I read this wrong. You are asking how to keep from pouring the drink and finding that all the Coconut Cream is still stuck to the inside of the blender? BTW, the stuff I was referring to is Coco Real. 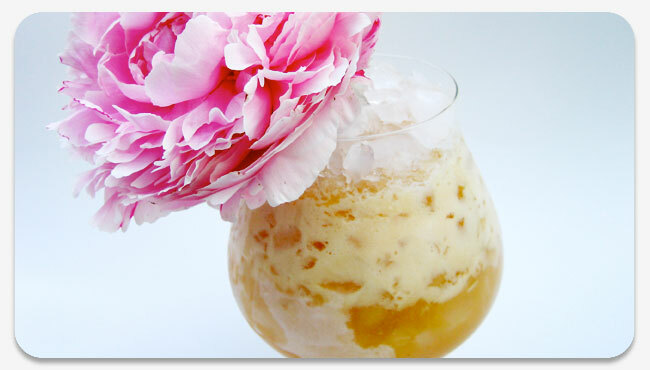 I just can´t resist saying how cool i think that BIG Peony is in that drink..
A Giant Peony in a Painkiller? its sooo cool! As for the Cream of Coconut separation, i also believe in a a good amount of acid hard shake. Or pour it in a Tikimug. 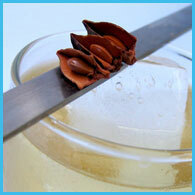 This is one of the garnishes i love the most of all i`ve seen, its just fabulous. Rick, do you still have trouble sourcing Pusser’s? What about demerara rums? Make the trek north my friend! Come north across Lake Erie and discover a whole new list of brands that the gov’t run liqour store doesn’t stock. There is El Dorado though.. and Havana Club too!